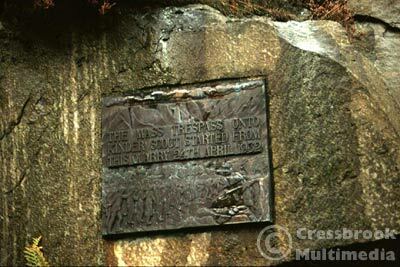 Those words were penned by the folksinger, Ewen McColl, in his famous song, ‘Manchester Rambler’; to commemorate the mass trespass on the moorland of Kinder Scout in 1932. Since then the open moors and hills of the Peak District, and indeed of England, Northern Ireland, Scotland and Wales have been accessible to hikers and ramblers. Prior to that, landowners exercised what they saw as their right to restrict any movement over their land. They employed gamekeepers, often armed ones, to enforce these restrictions. The mass trespass that began in a quarry between the village of Hayfield and the moors of Kinder Scout, started a movement that culminated in the formation of The Ramblers Association, a nationwide institution that is still very active today. Since that time, and up and down the country, locally manned pedestrian organizations and clubs regularly walk along footpaths and bridleways to prevent them being closed to public access. On that day in 1932, the great British public started to realize a dream that has been going on ever since; that the British are free to roam the hills and valleys that many of their number died defending in two world wars. To me, coming from a working class family from Saddleworth, some fifteen miles north east of Manchester, it has meant that I have been able to get out onto the hills, in the Peak District mostly, and enjoy the splendour and space they offer. 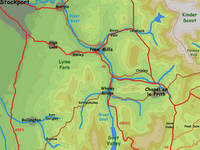 As a lad of 14, I set off one Sunday morning, rhucksack, thermos flask, map and compass, traveling by bus to the Derbyshire milltown of Glossop, at the foot of the hills that surround Kinder Scout. Phillip Webb, my long time walking pal and good friend accompanied me on the long haul over Snake Pass, down to the Snake Inn, from where we crossed the main road, the A57, and wended our way along what is known as the Snake Path, along the northern flanks of Kinder Scout until the track climbs to cross the Pennine Way beneath the gable end of Mill Hill. 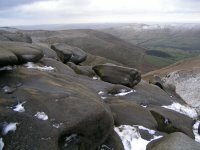 That was the first time I saw Kinder Scout. It's bulk, its wildness and its relative inaccessibility attracted me. I have visited it regularly ever since. Those good people that 'trespassed' in 1932 deserve everyone's gratitude - they certainly have mine.